The Brit and I were invited to attend the Far Niente and Nickel & Nickel Winemakers Dinner at the Meritage Resort in Napa. When we accepted the invitation, we were unsure what to expect other than dinner and wine. I don’t think we could have imagined a night as grand as the one we experienced. It was an absolute WOW! 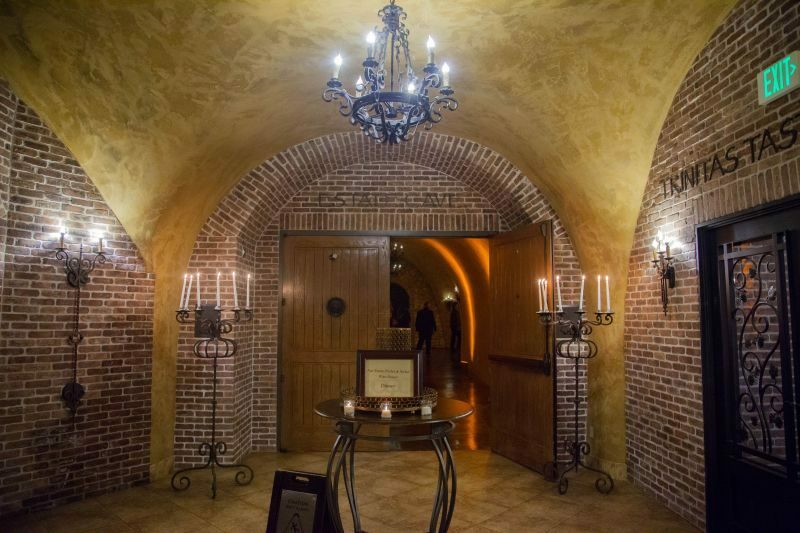 If you haven’t been to the Meritage you should put it on your list of must go places. 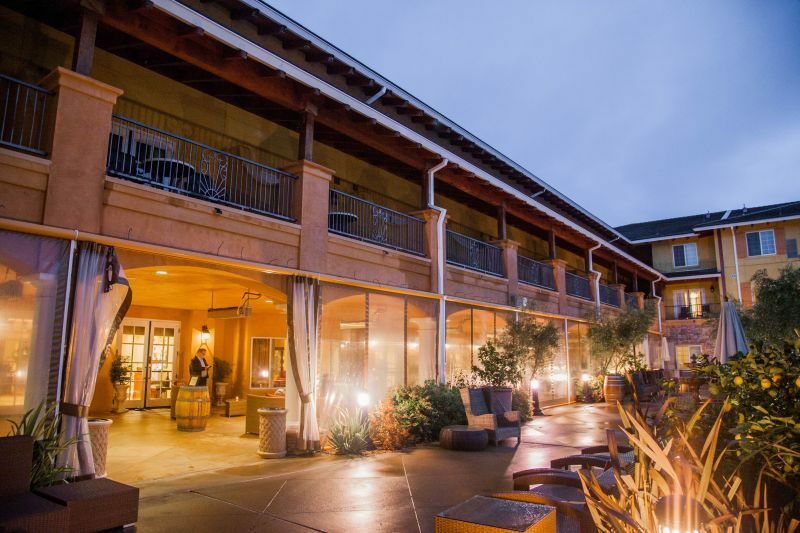 It is one of the most luxurious resorts in Napa. 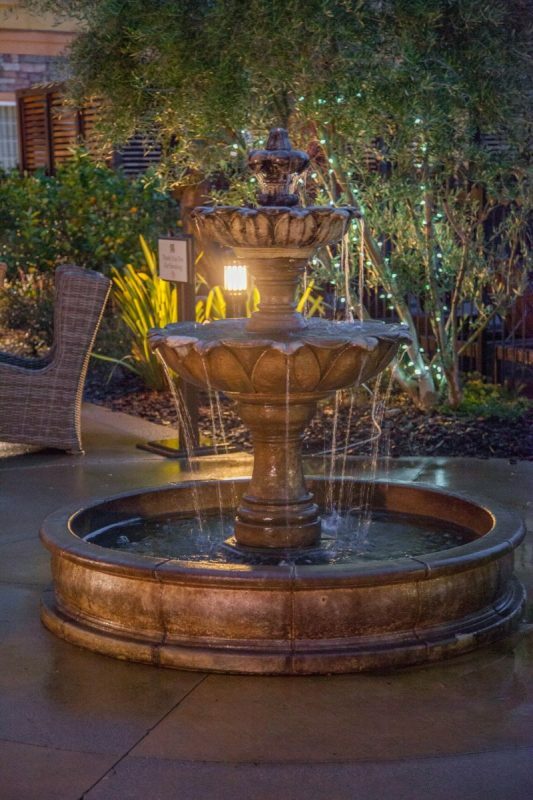 Tuscan style architecture and decor, wonderful restaurants and bars; this resort even has its own winery called Trinitas. We wrote an article about their Sunday Brunch several months back. They got top marks from us. The Winemaker Dinner was for sister wineries about which we knew nothing; other than having passed Nickel and Nickel many times on Highway 29. I think it added a little to our excitement; stepping out of our comfort zone with both the food and the wine; we didn’t know what the menu was before hand either. We were going to just experience it as it came. Honestly, in hindsight, I am so glad we did. We arrived and asked at the information desk where the winemaker dinner would be held. We were given good instructions and we found our way to the area where we would begin our wine and culinary journey. We started out with a before dinner wine hour on the enclosed patio area of the resort. 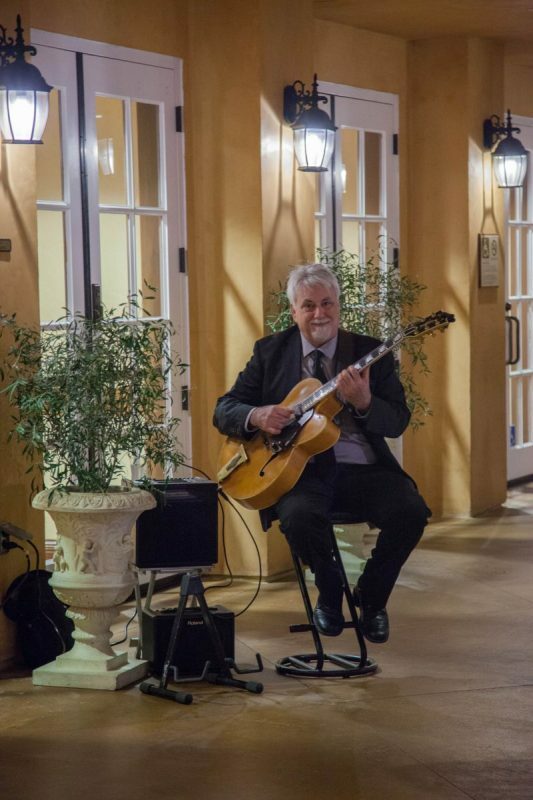 They had set up comfy places to sit, relax, and mingle; along with a classical guitarist playing soothingly in the background. We were then offered our first glass of Nickel and Nickel Stilling Chardonnay. I loved the rich well-balanced flavor of the Chardonnay with pear and vanilla on the palate. It featured a slightly floral nose and a light oak finish. It was weighty in the mouth and paired wonderfully with the appetizers. The Brit comments: Having been underwhelmed earlier that day with the Chardonnay at Grgich, this was a delight. The nose was a fine balance of pear and vanilla. The flavour was a melody of lemon, pear, and lime; that lingered and offered a counterpoint to the silky finish. The appetizers included blinis with caviar, cream, and flower petals, beef consumé with a cheese crisp, oysters with a tomato and chive salsa, and lobster and crab rolls. We didn’t try the oysters, (we don’t enjoy them) but the rest of the bites were outstanding. 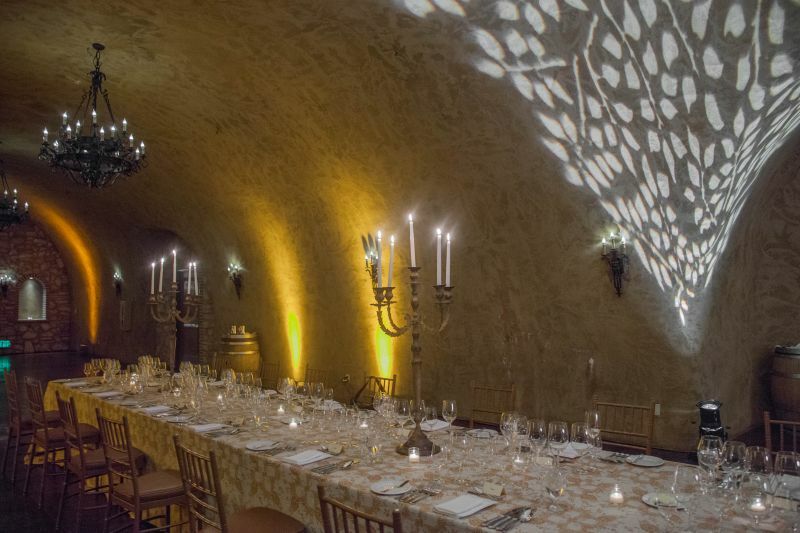 After what seemed enough food for a meal, we were shown into the gorgeous wine cave for the seated portion of our dinner. I can’t even express to you just how gorgeous this space was. It was simply magical. In the center of the cave sat a huge table set formally with heavy brocade tablecloths and real candelabra. 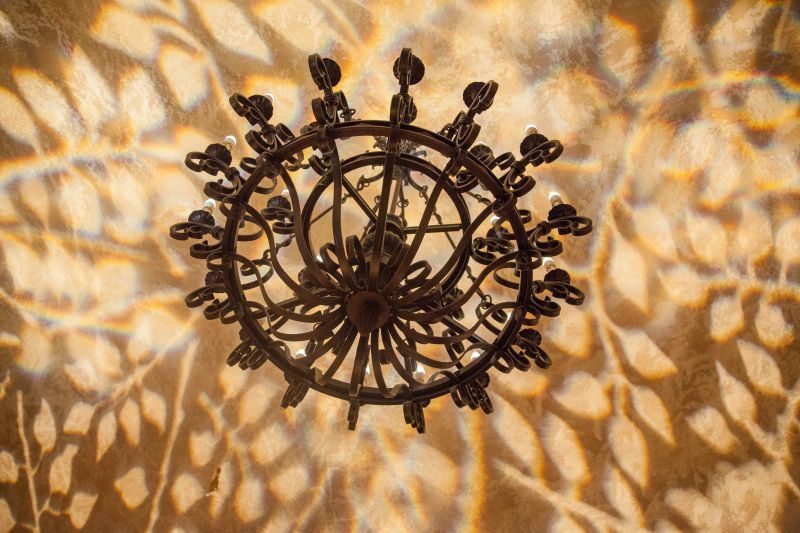 The ceiling was lit with gorgeous chandeliers and what seemed like leaf-shaped light stencils. The effect was amazing; romantic and fairytale like. I wanted to take tons of photographs to capture its true beauty but there really wasn’t time for that and the other guests were coming in quickly. My photos just don’t do the space justice. Once we were all seated, we were introduced to our chef for the evening along with the winemaker from Nickel & Nickel and a representative from Far Niente. We were also served our second wine of the night, Far Niente 2015, Napa Valley Chardonnay. I got tropical fruits and cream on the palate. It’s a very balanced wine without heavy oak or butter in the mouth. It was a lovely pairing with our first course. The Brit comments: Bringing the glass to my nose, I detected the aroma of apricot. Taking a sip, I tasted vanilla and apples. Once I had a bite or two of the crudo, I found the wine added green pepper flavours to its well-balanced taste. The first course was a Fluke Crudo. That is a very fancy way of saying it was pieces of raw Kombu fish served Asian style with Tokyo turnips and wild chickweed. It was slightly dressed in a citronette. If you are a lover of sushi or sashimi you would love this dish. It was light, fresh, and the perfect cleanser to the palate. Since the wine had strong flavors of tropical fruits, it blended beautifully with the citronette dressing and complemented its flavors without overwhelming the delicate fish. The second course was a smoked mushroom stew. 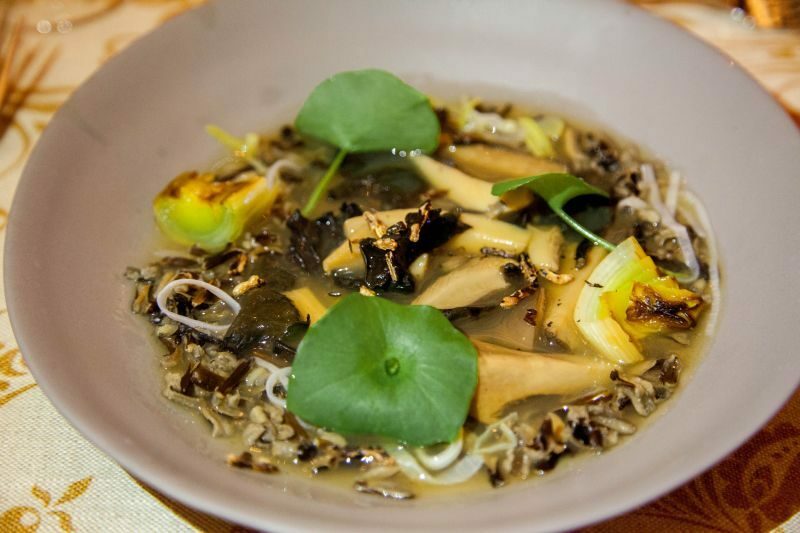 It featured caramelized and pickled leek with puffed wild rice. There is nothing better to describe this dish other than earthy. The stew was packed with mushrooms of different types and the caramelized and pickled leek gave it a tang and prevented mushroom being the single note of flavor. The puffed rice added texture to and gave it kind of an almost barley sensation in the mouth. 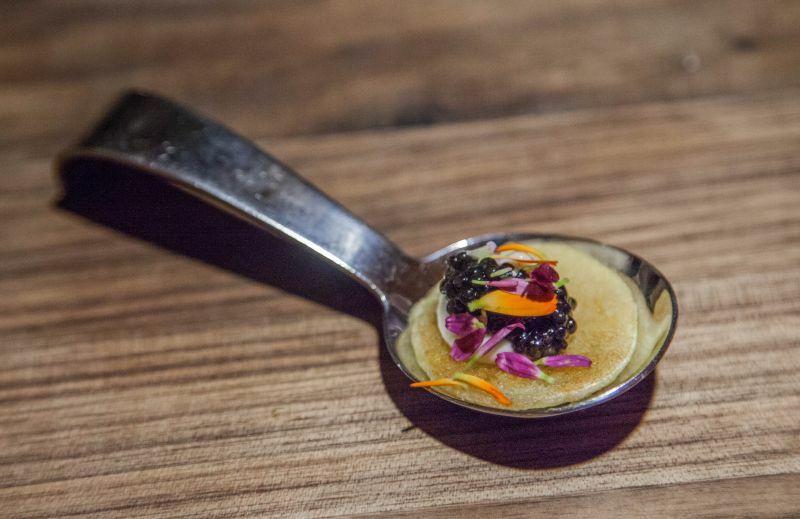 This dish was paired with the EnRoute “Les Pommiers” Russian River Pinot Noir 2014. (EnRoute is another winery in the family). This wine was stunningly good. I could have ended my night right then with a bottle. I am glad I didn’t because I would have missed out on the other amazing wines, but I loved how this was full of dark cherry flavor. It was everything a good Pinot Noir should be. Bold, smooth, supple, and oh so drinkable. I could wax lyrical about it for hours. The Brit comments: The nose was a classic Pinot mix of black cherry and strong earthy notes. The first impression as I swirled the wine around my mouth was a soft, fruity wine; letting it linger allowed the tannins to expose a tartness of cherry. The next dish was the king salmon in Panang curry sauce with bitter greens and pickled pearl onions. I absolutely adored this dish; it had so much flavor! The curry sauce was Thai in style. The fish was cooked beautifully and I have to say, the chef really nailed this dish. Every single flavor was in harmony; there was no overwhelming note of lemongrass or chili. It was just right. The only thing that I was a little more than puzzled with was the portion. It was a full entrée size and I knew there was more to come. It was really hard to just take a bite or two as it was so delicious. The salmon was paired with Nickel and Nickel 2013 Branding Iron Vineyard Oakville Cabernet Sauvignon. I liked this wine, but this is where I feel the chef made a mistake in the pairing. Although the wine has texture and spice to it, it just didn’t work for me with the curry or the salmon at all. I was so frustrated that I ended up grabbing The Brit’s leftover glass of Nickel and Nickel Stilling Chardonnay to finish my bites of food. Now that was a perfect pairing. My notes on the Cab included raspberry, plum and black licorice on the palate, silky in the mouth with a hint of cocoa and firm tannins. This wine, although very approachable and delicious right now, will be a stunner with a couple more years under its belt. 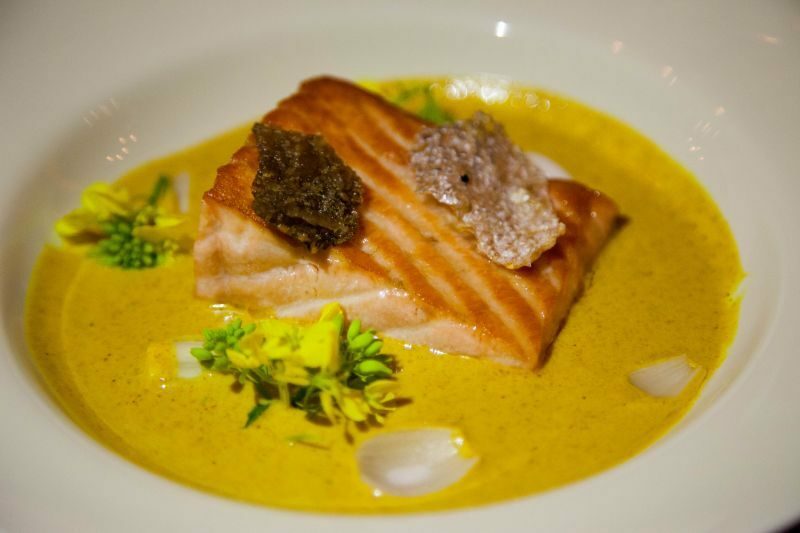 The Brit comments: I was intrigued when I saw salmon curry paired with Cabernet Sauvignon; one-eighty degrees from the commonly held understanding of a perfect pair. Unfortunately, whilst both food and wine were delicious, they failed to work together at all. This was the one failing in the entire evening and even that was offset by the quality of both parts. The wine had a nose of blackberry, plum, and cocoa. The mouthfeel was dark and rich with tannins balanced by cherry and plum. The wine was a 100% Cabernet Sauvignon from a single vineyard. Our next course was a duck breast finished with cherries, bourbon, dates, and coffee compote. When reading this, I have to tell you that I would have never ordered this combination in a restaurant. There was a lot going on and I couldn’t imagine the flavor combination. I would have missed out on something FANTASTIC. This not only had coffee but real coffee flavor. It gave the rich duck almost a smokey flavor and cut the sweetness of the cherries. The bourbon also made the cherries a little more savory and gave them depth and it all somehow worked with all of those flavors. Hats off to the chef with this one, it was extremely creative! The Brit comments: I love duck and eat it whenever I see it on a menu. I had not come across it served in this manner before; as California Girl said, here was originality that delivered stunning results. If I need to offer any criticism, I think there was a tad too much salt on the duck. 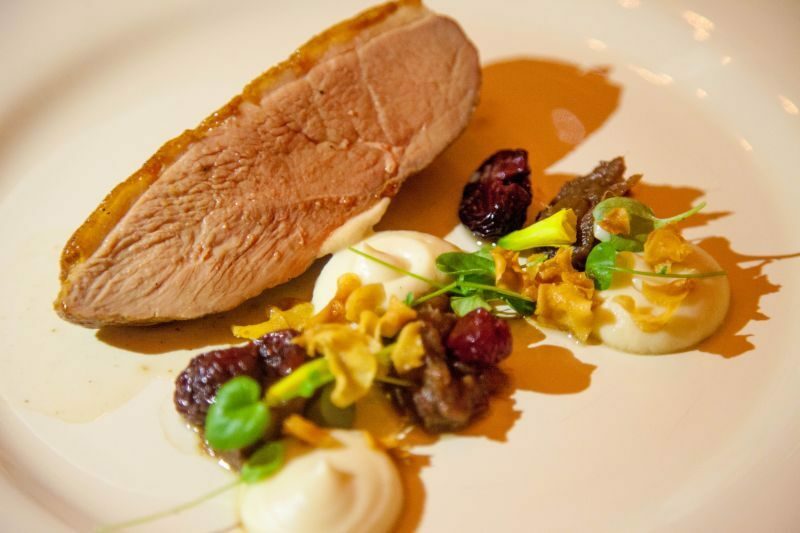 The duck was paired with the 2013 Nickel & Nickel Sori Bricco Vineyard Diamond Mountain District Cabernet Sauvignon. I absolutely LOVED this wine. For my palate, it was Cabernet perfection. It had an amazing flavor, with firm structure and lovely mouthfeel. I had cranberry, vanilla, and cherry on the tongue and a long, lingering, smoky oak finish. The words “crazy good” come to mind but that really isn’t proper wine language is it? The Brit comments: The nose on this was restrained, with but a whiff of blackberry. Taking a sip revealed a soft wine that gave way to a tingle of tannins and a finish of blackberry. This more restrained Cab was a wonderful complement to the duck. Our final main course was Wagyu pot au feu. 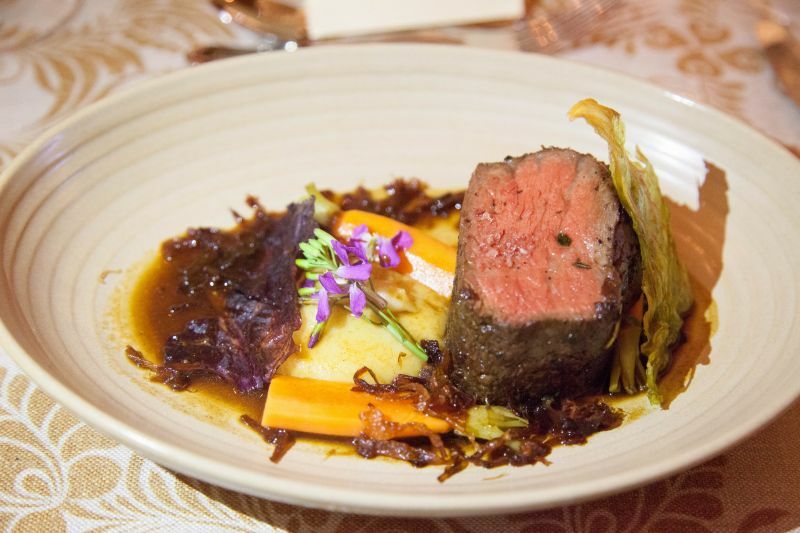 It was a fancy way to describe a steak of Wagyu beef served absolutely perfectly medium-rare; in a deep beef jus and accented with carrots and potato purée. Despite my skirt feeling really snug at this point, I ate happily. This was comfort food at its finest. Simply delicious. The wine that was paired with the beef was the 2014 Far Niente Oakville Estate Cabernet Sauvignon. I put a big star next to it so that I could say that it was my favorite of the night. Honestly, looking back on the wines it is hard to choose a favorite. All of the wines were so impressive. This wine is actually a blend of Cabernet Sauvignon, Cab Franc, Petite Verdot, and Malbec. I got baking spices, licorice, and anise on the palate with a lingering finish. This had gorgeous structure and I was surprised how drinkable it already was for its young age. The Brit comments: This wine had a dense, punchy nose that combined black currant and espresso. Taking the first sip I encountered robust tannins that gave way to a finish of intense fruits with blackberry and cherry at the fore. The tannins now expressed themselves as black tea behind the fruit. This is a wine that should age beautifully but is already eminently drinkable. At last, we reached the dessert part of the evening when I thought I couldn’t get any more surprises, but there were still some in store for me. The head pastry chef of the Meritage was introduced to us and she explained what she had created. It was cute because it was her birthday and everyone sang to her before she offered us our dessert. I have never in my life seen anything like the dessert that was presented. It was a foie gras stuffed doughnut with blood orange sorbet and a goat’s cheese bavarian (think goats cheese cheesecake). Well ok then, this I had to try! 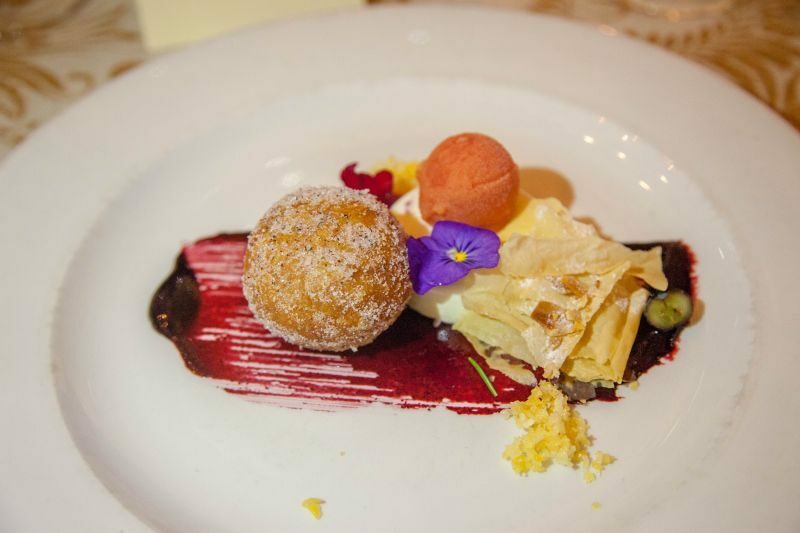 How on earth does someone combine a doughnut and foie gras? It was exactly how it sounded. It was a simple light cinnamon sugar coated doughnut filled with foie gras. It had that whole sweet/savory thing going on. It was completely unique and delicious. The accompanying sorbet was excellent. The flavor of the blood orange gave the plate a kiss of citrus. The combination of blood orange and the foie gras was great. The final piece was the goat’s cheese bavarian. I thought the chef was clever in putting this together with the blood orange sorbet and the doughnut as it gave the sour goats cheese flavor that bridged the other flavors together. The berry scrape gave that last little accent of sweetness to make the whole thing sing. It was a truly challenging dessert to the palate. I am glad I experienced something so completely original. The Brit comments: This dessert had sour and sweet in balance. California Girl was, as she has said, at the point where she was tasting the tiniest of bites, so she missed out on one last surprise in the dessert; there was something that felt like pop-rocks when you put it in your mouth. I took a bite and suddenly there was a sparkling sensation on my tongue; a further intriguing dimension to a complex finale to this wonderful meal. The final wine of the evening was some 2010 Dolce Napa Valley. It had an overwhelming flavor of kumquats on the palate which worked great with the sorbet and the cheesecake. It’s a very weighty wine and, of course, sweet. It has an amazing flavor. As always, I would pair this type of wine with sharp cheese because it needs it to tone down its sweetness and give it balance. I think it was a good pairing to what the pastry chef accomplished. The Brit comments: This wine was made in the style of a Sauterne; with the grapes harvested late in the year, sometimes as late as December. It sits on the lees for three years in new French oak. The result is a wine with a nose of orange and honey. I am not a fan of sweet dessert wines when I go tasting, but here in its natural habitat, it was a delight. Instead of a cloying sweetness, there was a delightful melody with the carefully constructed dessert. The orange sorbet’s acidity cut the sweetness to perfection. I can’t say enough about how fabulous this evening was. We had the opportunity to really talk to the winemaker, chefs, and other guests throughout dinner about what we were eating and drinking. It was an extremely sociable night, even if you didn’t know anyone else there. It was intimate and special and I wouldn’t hesitate to accept another invitation from either the winery or the Meritage. I can only imagine how gorgeous other events are in this space and on the property. The Brit comments: I love to go wine tasting, but wine is better with food and so this opportunity to pair the drink and the meal made for an experience that enhanced both elements. The beauty of the location added a third dimension to the evening. There are opportunities to try a Winemaker Dinner throughout the year and I would highly encourage you to check them out. Tickets run from $99 per person to around $349 per person, but believe me, it was really worth every penny for this full culinary experience. You can get information about the upcoming wine-makers dinners here. 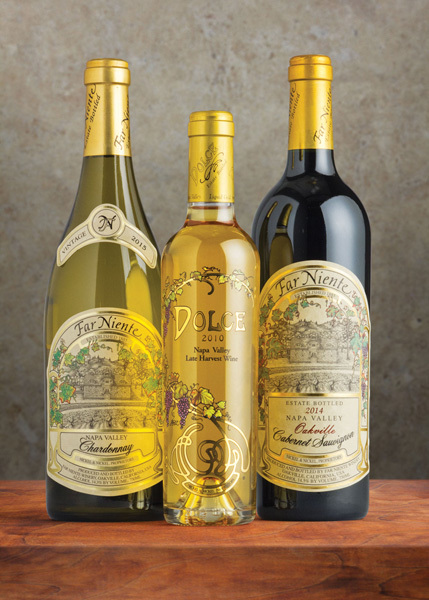 I would also highly recommend you visit Far Niente and Nickel & Nickel Vineyards. We were truly impressed with their wines and we would love to experience more of what they are doing. 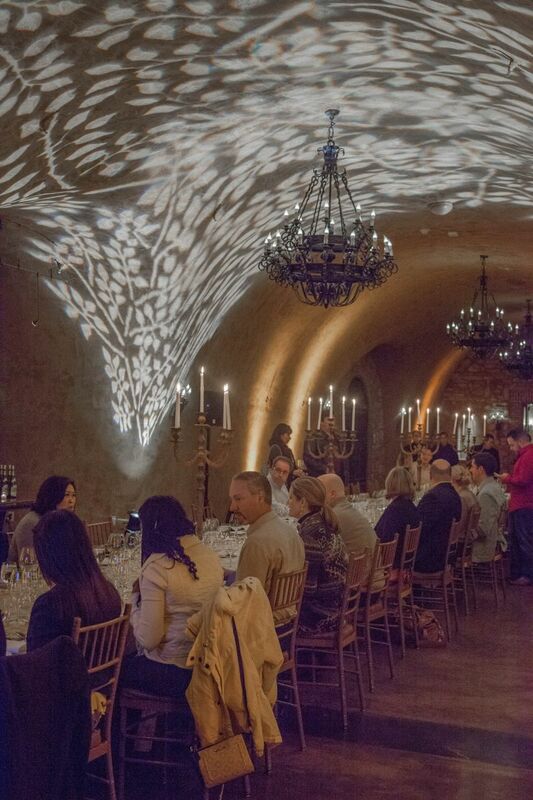 Amazing food, beautiful setting, fantastic wines… a perfect night.